The process which was needed to get into student exchange is certainly long, but now it's finally coming to an end and the flight date is closing in. Few weeks before I got my visa and thought everything was going as planned, yeah. 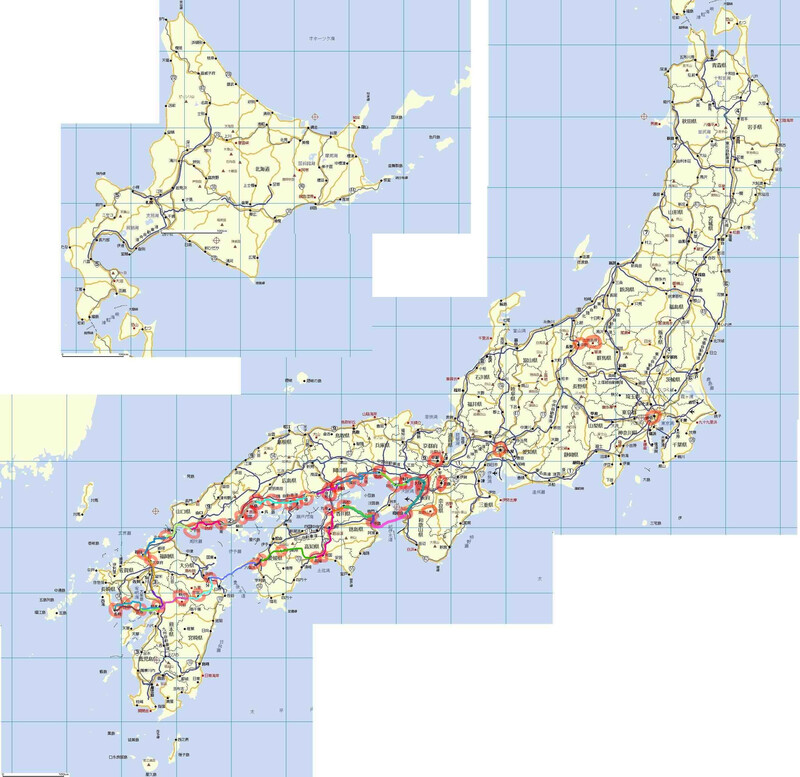 The same week's friday earthquakes hit and caused havoc in east coast of Japan. After intensivily following news from Japan, I didn't cancel my trip to Japan. So, I will be boarding the plane on 31.3. about 9 am, with dosimeter in my bag. I will be writing (rather randomly) to this blog about my life in Japan, and so on. I will use mostly english, but you might get to see some entries partly or entirely in Japanese or Finnish. I might upload some pictures too, if I get camera somewhere (I really should). I hope you will enjoy reading. Feel free to comment. After the long flight (about 18 hours if I remember right) I arrived to Japan 1.4.2011 about 8 am. From there I took train to Osaka, where I changed to train to Kobe. The weather was sunny and the scenery I saw from train was nice. One thing that I found interesting was the small farming fields inbetween the houses and the little tractors used to plow them. That was well before Osaka though. At the Osaka Station I was little bit lost (the place is a maze) but found my way to the Umeda Station and the part from which Hanshin trains took off. After I got the dormitory, I had to wait a bit since it was lunch break. Then I had to pay for the rent and got the keys and such and someone to show me the right room. There is 4 rooms, common room with kitchen and bathroom in one unit. Everyone has their own WC though. My roommates are 4th, 3rd and 1st year students, and they're all real nice people, helping and explaining things, like the trash system, filling in papers and such, to me. I have to go and formally register to the school as soon as possible. Also I think I will be getting mobile phone and bank account during next week, hopefully. Meanwhile I've been checking where to go to vote as the election is soon in Finland, and I thought I'd vote this time. I think I can do it somewhere in Osaka. Today I will probably go shopping some things I need or forgot, like towel, LAN cable and so on. It will probably take some time until I get some pictures here, sorry for that! PS. It's surprisingly cold inside, I guess Japanese insulation isn't as good as Finnish ones. There is combined airconditioner/airheatpump at each room and common room though, so it helps. I got a ride from my roommate to the 東灘区役所(Higashi-Nada Regional Office (or city hall if you will)), where I applied at the Alien registration. After that I was told I should also join the 国民健康保険(Japanese National Health Insurance), which I did, and which costs approximately 2000円 (about 20 euros) a month. It might be enough so that I don't need the insurance from a private company, which costs more.. I haven't decided yet. I then left the 区役所 and went on to find the bank, called Sumimoto Mitsui Banking Corporation. After going around once where it should've been, I asked someone and found it, I had walked right past it. Soon after I was opening an account with help from an enthusiastic bank clerk. In the evening, I went to check out one mobile phone company (AU) with another roommate. More about mobile phones later! I went to the university for the first time. It was sunny, rather warm, day, and I had decided my route as walk to train station -> few stations west -> walk to university. I should've taken map with me though. I wandered almost randomly trying to find the first station, although I finally found it. At this point I was sweating a bit, since it was quite warm and sunny day. Well I got to train and off without any problems. Then I started walking towards the university, which I did, in a way, although I walked bit too far at first. It was also uphill whole way, so I was really sweating after I finally decided it couldn't be that far from the station. So I went little bit more east, and finally found it (although I was at wrong department, but there was a campus map outside so it was fine). Next I wandered around the Engineering department's building trying find the Students Affairs Office until I finally asked where it is and was guided to it. Then, I got my student card, more documents to fill out (like application for host family program), some guidance about following weeks and so on. So I started my way back, and carefully made notes in my head about the way so I wouldn't get lost next time. On the way home I went to check other mobile phone companies (Docomo and Softbank). A word about mobile phones in Japan: They're expensive (I heard they're about the same in USA too later, but I'm of course comparing to Finland). Roughly said, I have to pay about 10 times a month compared to what I pay in Finland. For example, internet without restrictions(eg. able to browse "PC sites") is 5900円 (=almost 60€ !) a month, while in finland you get it for just 5€ a month. Phone calls, well, without a call plan with free minutes, it's 33 cents / minute. With a call plan with 55 minutes free time, it's 15€ a month, and 30 cents per minute of what goes over the free time. Japanese phones, although nowdays also SMS compatible, use E-mail as main text based messaging system. If you take a call plan, using mail will raise the price of the internet fast to about 40€/month, although it won't go any higher ( ei paljon lohduta silti :D ). Oh and one thing is, if you don't make 2 year contract, you have to pay about double per month, and you need to buy the phone itself. I took a 2 year contract with mail plan at Docomo, meaning I can use mail as much as I want and the monthly pay is around 10-15€, phone calls are 33 cent / minute (receiving is free though) and if I use internet (for example, loading a map to use with gps) it's up to 40€ (or about 55€, if I happen to view "PC sites"). Gotta be careful with this and use mail only..
Well, the benefit of taking 2 year contract was of course the cheaper monthly pay, and also I got the phone for free. Mainly I made the deal with Docomo, because their "0 yen phones" had one over others, it has touch screen, and wireless qwerty-keyboard too. Most japanese phones are able to receive TV broadcast (for free, whew), and this model is able to do it too. The bad thing with 2 year contract is, that it's 2 year contract, and I'm staying in Japan only for about a year. So, I need to break the contract and that will cost about 95€ at that time. I went to the university for the second time, to turn in some documents I had filled and to show the National Health Insurance card I got in the post. I found my way nicely this time! Tomorrow there is a bazaar for exchange students, I might go there and try to find a cheap bicycle or/and rice cooker. After that there's orientation, and welcome party for new students. The post came out bit long, hope you have fun reading it! I might add a picture later, it's a view from the university over the city. Okay, lot's of things have happened in this short period again. The party on last friday was pretty nice (bonus: free dinner!). On saturday I went to Osaka, to vote in finnish election. I met few finnish people who had been living various times here. We had lunch together and talked about quite few things, it was fun. I went to school to do few things. Tuesday morning I thought a bit and realized that the courses start actually this week, even though I have to submit the registration until the end of april.. Oh well, missed just one class luckily. Later that day, I got e-mail from Student affairs, that there is a student who is interested in student exchange at TUT, and if I could answer her/his questions. We promised to meet tomorrow and talk about it. Today, my bank transfer apparently came to the bank, they called me and asked about it. They seem to be pretty careful. I think I will go there tomorrow to try to explain something like that I'm going to get a monthly pay from Finland + I might make more transfers personally. Well, that's all for now folks. I'll try to be back later this week! Yes, I'm going to start teaching Finnish at language school.. They we're desperately needing Finnish teachers apparently! The pay is quite good, and it doesn't take too much time either. Perfect for a student like me I guess. On Sunday, I went to see Himeji Castle, which is UNESCO World Heritage site (Thanks Sakke! (old:(maailmanperintökohde vai mikä se on))). It was really amazing place, I will sent in some pictures as soon as I get them from my friend.